Japanese two-wheeler manufacturer Honda Motorcycle and Scooter India (HMSI) has rolled out a deluxe variant to its most affordable motorcycle, the CD 110 Dream Deluxe (DX). 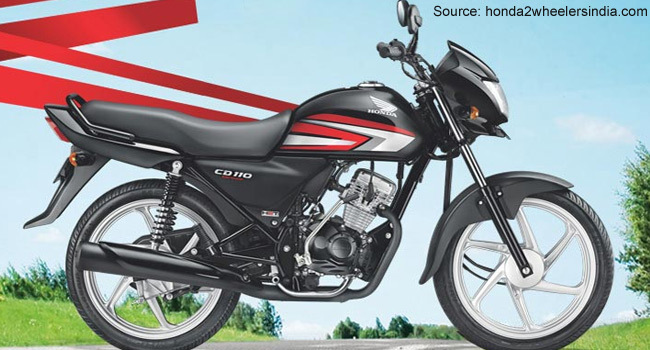 The Honda CD 110 Dream Deluxe (DX) comes with a starting price-tag of Rs. 43,997 (ex-showroom, Delhi) for the base variant (kick-starter, drum brakes, alloy wheels). The new deluxe variant of the existing air-cooled, single-cylinder, 110cc mass commuter motorcycle model CD 110 Dream gets a self-starter switch and exclusive new colour graphics (black with green stripes). The new colour graphics - black with green stripe, introduced exclusively for the new deluxe variant- comes equipped with the same specifications as the CD 110 Dream. The new variant also gets Honda’s popular HET engine technology, which will be available in four colour options including the newly added colour graphics. The CD 110 Dream offers a fuel efficiency of up to 74km per litre, and delivers a peak power output of 8.25bhp at 7500rpm. Features such as 179mm ground clearance, 1258mm of extended wheelbase, long seat, tubeless tyres and others at its price point make the Honda CD 110 Dream a competitive mass commuter. The Dream Deluxe has a ground clearance of 179mm, and an extended wheelbase of 1258mm. The Deluxe version, which was first unveiled at the 2016 Auto Expo by the company, is understood as an attempt to boost the sales of its mass commuter motorcycle portfolio at the most affordable end. An official release from the company mentions that it has started despatching the new model to its dealerships across India.